I think I bought this bag at a Goodwill several years ago because the color attracted me. Buying the bag had been an impulse towards the grotesque. I liked the idea, the concept, plus, it was only ten dollars. I only noticed later that it had a Versace tag on it. I don’t really know much about Versace or what it means except it means: fancy. At the same time, I don’t think there’s anything less fancy than a gold, fake-leather duffel bag. Is it a gym bag? I mean, what do you carry around in a gold duffel bag? Back when I was dating, I used it to bring my clothes and tooth brush over to men’s houses. I didn’t think much about it at the time, but bringing it over to a man’s house and throwing it onto the floor, watching it crumple under its own weight next to an unmade bed, did make me feel kind of sleazy. I didn’t like the bag being seen by other people. But what was I supposed to do? Use it to carry around things inside my own bedroom? What use was a bag you didn’t want to be seen with? Maybe I was the kind of person who buys a gold duffel bag but then never leaves the house with it. I have an old friend named Shawn. When we were in our early twenties, he used to joke about marketing and selling something called a “ho-bag”. It would have all the essentials for seducing a woman in it, like candles and a bottle of wine. Shawn talked a lot about the bag, it was the joke he made for a few months. But for how much he talked about it, I never saw it. I never knew if he actually had a “ho-bag”. One year on my birthday, after a night of drinking and dancing, he followed me home and tried to give me a back rub. I was drunk. “Where’s your alcohol?” he said. “We don’t have any booze in the house,” I said. I just shrugged. I wondered what the emergency was. Shawn went out to his car and got a six-pack of Pabst Blue Ribbon from the trunk of his car. He drank one in my living room with me before I told him I was tired and was going to bed. Now I’m not dating anymore and I use the gold duffel bag to haul my belongings from one house-sitting gig to the next. This spring I’m dog- and cat-sitting for more than a month straight. Both the dog and the cat are old. They’re on painkillers and CBD oil. They sleep most of the time and are easy to take care of – except I can’t shake the feeling they’ll both die soon and then I’ll be out of some good-paying gigs. It’s a weird feeling to be sitting in a mansion in Happy Valley and know that a small feline’s health is the factor that pays your rent. Sometimes I feel like the palace bird-keeper; so much depends on this small creature’s beating heart. And it’s an odd feeling to be so close to poverty while surrounded in the physical manifestation of wealth. And to be alone. Alone a lot. I never forget that the mansion in Happy Valley is not my home: I can’t really have friends over, I try not to makes messes. I’m close to luxury, but don’t live in luxury. I stay in someone else’s home so I can afford to stay in my own home. Don’t get me wrong, I don’t feel sorry for myself, I’m grateful for these easy gigs. It’s just that I know the difference. This isn’t a vacation from my life. It’s still work, otherwise they wouldn’t be paying me. And I also recognize the irony, that with my life so disrupted and busy and stressful over the last month, all I feel like doing is getting away. Getting away? To where? I haven’t been home in weeks! I’m in bed now, at the place where I’m dog-sitting, and I remember the last time I was in this bed: I’d invited my boyfriend over and we got into a stupid argument about human sexuality. He told me it wasn’t a topic he was interested in. I’m not sure why he told me he wasn’t interested. Maybe he just wasn’t interested in the theory behind it. Maybe eventually I wasn’t interested in the practice of it. I remember asking my boyfriend at the time, when I bought the gold duffel bag, what he thought of it. “It doesn’t seem like you,” he said. He was right, it didn’t seem like me. Maybe an heiress like Paris Hilton would use this bag to put clothes in, to bring them to the Goodwill. Maybe a female pro-wrestler would use it as a gym bag because it matched her gold lace-up boots. But I am neither an heiress nor a pro-wrestler. 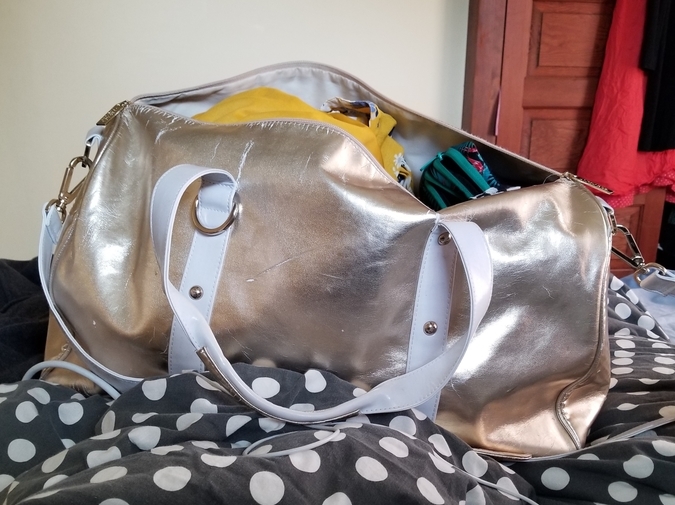 I am someone who, at one time, had ten dollars to waste on a silly gold duffel bag that she doesn’t even like. I mean, I like it in theory, but not in practice.